Are we being punished here? 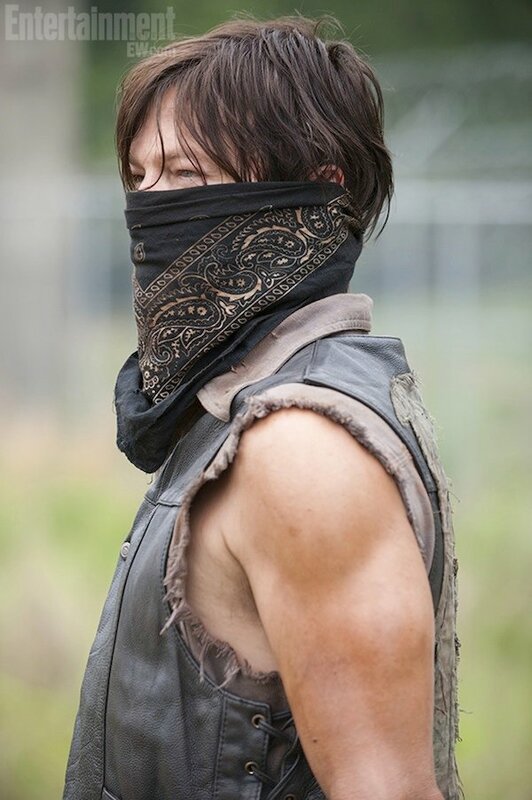 Ok, maybe that's an exaggerated reaction, but after celebrating the presence of on Daryl Dixon - mostly front and center-ish - on the Walking Dead Comic-Con banner, the newest photo from the anticipated fourth season of The Walking Dead gives us another glimpse of Daryl, unfortunately most of his face is covered up with a bandana. Optimistically, partial-view Daryl is better than no Daryl at all though, right? And there's no mistaking the hair and the eyes, or the guns. Arm-guns that is. We all know Daryl favors the crossbow as his weapon of choice. So what exactly is going on here? EW offers a bit of fun speculation involving convenience store robberies and Jesse James impersonations, but I'm going to go out on a limb here and say Daryl's trying to avoid some kind of smell or disease. A bandana might not do much to deflect really infectious germs though, so let's lean toward the smell theory. They're in zombie-country, after all, where dead bodies - both reanimated and fully dead - seem to be plentiful. There's also the potential for rotten animals and/or food to be stinking up the place. Maybe Daryl's tasked with dealing with a particularly smelly situation and he's wearing the mask to curb the stench. Or he just wants to look like an outlaw, because looking tough-guy is always in season on TWD... not that Daryl needs to accessorize to pull of that look. Thursday July 18, 2013 4:15pm - 5:15pm - Room 6A - Robert Kirkman discusses the evolution of The Walking Dead and his plans to celebrate its 10th anniversary this year, in a lively Q&A forum. 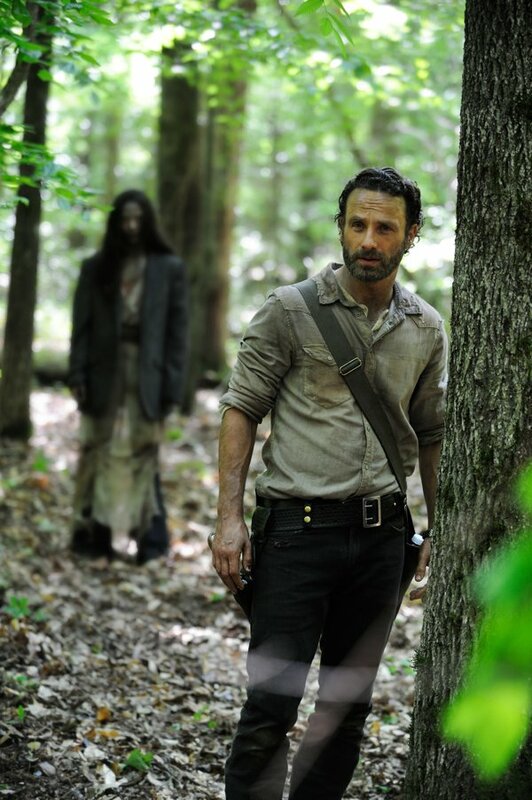 The new photo follows the previously revealed Season 4 photo, which shows us Rick in the woods.